We recently finished painting a variety of parts for the Sycamore, a U.S. Coast Guard cutter based out of Cordova, Alaska. The project is an excellent example of how, when applied with care and precision, protective marine coatings extend the lifespan of valuable vessels exposed to harsh marine conditions. As with our previous Coast Guard projects, this job was overseen by a Coast Guard inspector. He inspected the SP10 Blast, as well as each coat to ensure proper application and mileage. In-progress painting photos. Click images to enlarge. The USCGC Sycamore plays many different roles for the U.S. Coast Guard. It is primarily a “buoy tender,” tasked with maintaining and replacing buoys used for navigation and collecting weather data. Additionally, the ship has been used for search and rescue missions, oil spill containment, and marine law enforcement. It has also served as an icebreaker, clearing the way for other vessels to pass through icy seas. It was a pleasure to provide our services to the U.S. Coast Guard and be part of boosting the longevity of such an accomplished vessel. We’ve served as a resource for the marine industry for more than seven decades. This experience is what sets us apart. Another key draw for marine companies is our ability to complete large, multi-part projects off-site efficiently. Marine businesses can ship deck equipment and parts/pieces from their crowded shipyards to our facilities where they’re sure the job will be done right. We then return the components to the customer completed and ready to install. Serving the Pacific Northwest and Alaska, we’ve been applying marine coatings since 1945. Find out more about our marine services. From residential projects to retail shops and city landmarks, our experience in the architectural industry is rich and varied. Last month, we completed yet another exciting architectural painting project—large skylight frames for one of the most successful tech companies in the world. We were hired by local, Everett-based manufacturer CrystaLite to paint the skylight frames for their client. Made of either 100 percent aluminum or a combination of PVC and aluminum, CrystaLite’s skylights come in a variety of sizes and styles—such as domed, venting, and tubular. The painting stage of the manufacturing process occurs prior to installation of the glass within the frames. In this instance, the frames were a custom design and quite sizeable, spanning nearly the entire length of our large paint booth. Despite being a relatively straightforward painting project, the size and shape of the frames meant they couldn’t be stacked into trucks for delivery. Instead, they needed to be delivered and unloaded individually, requiring a bit more planning and manpower up front. Once arranged in our paint booths, however, we were able to hit the ground running. After some pre-painting prep, we primed the frames with an epoxy primer. For the top coat, we used a high solids polyurethane paint from Cardinal, a local company based in Woodinville. The paint, Cardinal 6407 in “shell white,” is formulated to provide high-performance protection while retaining color and gloss over time. Cardinal’s 6400 series is also designed to meet strict air quality requirements without losing its durability and high-gloss finish. After painting was complete, the frames were sent back to CrystaLite for final assembly before being shipped to California for installation. Painting architectural pieces for retail shops, public buildings and corporate offices requires meticulous craftsmanship and attention to detail. It also demands an experienced team that understands industry regulations and how different coatings perform in different conditions. Whether it’s window frames, exterior façades, hand railings, or another widely-seen architectural component, these pieces must be blemish-free and maintain quality for decades. With more than 70 years of industry experience, we’re happy to advise our customers on the best approach for their custom architectural projects. With seven paint booths, the largest spanning 6,000 square feet, we can accommodate your most sizeable architectural painting projects. Find out more about our painting and coating services. Having served the Pacific Northwest and Alaska for more than 70 years, it’s no surprise that much of our commercial painting work centers around the region’s thriving marine industries. Trawl doors, used in commercial net fishing, are a great example of how our durable marine coatings protect against the harsh, salty waters of the Pacific. Trawling is a fishing method that involves pulling a large net behind a boat, either along the bottom of the ocean or in midwater. The net is suspended between two fully submerged trawl doors, one positioned on the port side and the other on the starboard side. The trawl doors act as the net’s “arms,” keeping it open so that it can collect fish, squid or shrimp as it’s dragged through the water. When bottom trawling, trawl doors are dragged along the seabed, making contact with the rocks and sand. This friction, combined with the corrosive saltwater, is why it’s so important that trawl doors are coated in durable marine paint. Trawl doors come in all shapes and sizes, varying based on what’s being fished, the size of the vessel and the preferred position of the net in the water (i.e. 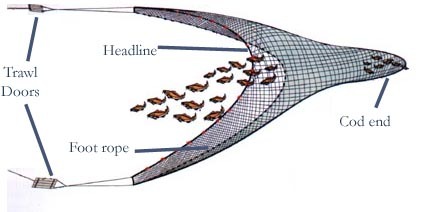 bottom trawling, semi-pelagic trawling or midwater trawling). Many trawl doors include moveable vents, bails and plates that the crew can adjust in order to change the angle of the net and the width of its opening. As with any of our projects that have intricate parts and cutouts, we take care to ensure there are never any drips, runs or dry patches. Over the years, we’ve had the pleasure of coating many different types of trawl doors for some of the region’s largest suppliers of trawling equipment. The coating process begins with blasting the doors to remove any rust, old paint or mill scale. Once blasted, the doors are lifted into the paint booths for priming and painting. With several large paint and blast booths, customers are able to send us several large trawl doors at once and can expect a speedy turnaround. We understand the tough, corrosive conditions of the marine environment. From metalizing marine decking to painting ferry boat benches, our work for the marine industry over the years has been vast and diverse. Among the types of marine protectants we use are epoxy products, moisture curing coatings, and a range of antifouling products to prevent the growth barnacles, seaweed, algae and other marine organisms. We’re also able to apply environmentally-friendly antifouling coatings to avoid contamination and help keep our oceans beautiful. Situated just minutes from one of the country’s busiest shipping ports, the Port of Seattle, we’re proud to be the region’s marine coating experts. Get in touch to find out how we can help support your next project. 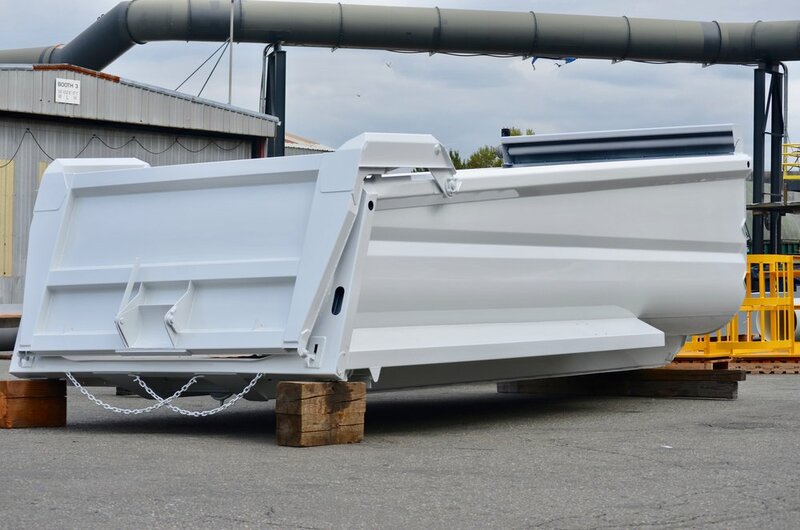 We recently finished painting several large dump truck bodies for one of the biggest suppliers of dump bodies in the country. This project showcases the benefits of commercial fleet refinishing—how companies can renew and protect existing assets instead of spending money on costly replacements. 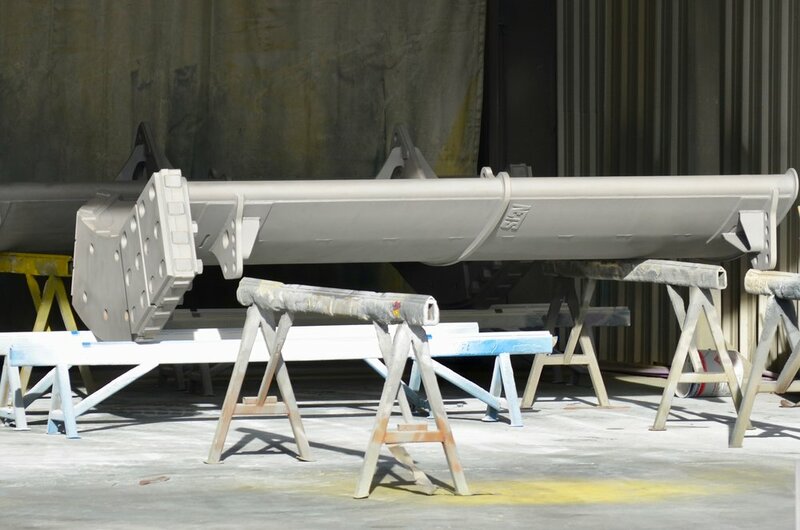 As with most of our painting and coating projects, our first step was to load the dump truck bodies into our blast booth, where we sandblasted away any rust and old coatings in preparation for painting. Once the surfaces were prepped, we applied a primer, followed by an Axalta polyurethane automotive paint. With several spacious paint and blast booths, our facilities are ideally suited for large industrial and commercial fleet work. Our largest paint booth spans 6,000 square feet and has 20 feet of vertical clearance, and our blast booth can accommodate work over 100-feet long by 20-feet wide by 16-feet tall. 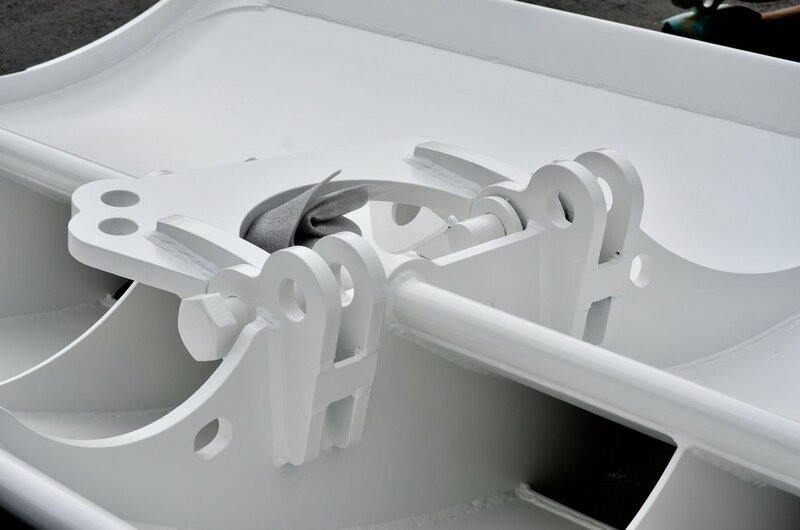 We also have a lifting capability of 65,00 lbs, allowing us to transport large truck beds, trailers and machine parts across the grounds for each stage of the painting process. Our automotive coatings help vehicles retain their gloss and vivid color for years. However, commercial fleet painting doesn’t just provide an aesthetic benefit, but it also protects vehicles and equipment from damaging rust, corrosion, UV rays and toxic substances. We use hardwearing, chemical-resistant automotive coatings, including high-performance clear coats, designed to withstand tough industry environments. From touch-ups to full paint jobs, we can provide super high-gloss finishes, decal removal, scratch and peeling repair, and custom color-matching. As one of Seattle’s longest standing commercial painting companies, you can count on our experience and expertise to get the job done. We’re excited to be part of an ongoing project constructing exterior façades for multiple high-end retail shops across the US. For this project PSC is painting custom storefront trims and moldings as a part of a larger install carried out by our client, a specialty glass company based near Seattle, WA. The company builds and installs retail shops around the country, including some very distinguished designer clothing brands easily recognized by their lavish storefronts. The freshly coated siding can be seen at dozens of shop locations across the U.S. now. Despite being made of urethane, once coated, the siding is presented and displayed as an extremely high-end, high-gloss finish. To achieve this, we use an Axalta coating, etch primer and single-stage automotive/fleet finish. The key challenge of projects like these is to ensure that every piece is completely blemish and dust free. Even the tiniest mark on the surface—as small as a fleck of dust or dirt—would distract the eye and dilute the overall effect of our craftsmanship. To achieve this, our team meticulously inspects each piece of molding at every stage so that the final product is as close to flawless as we can accomplish. As with all of our projects, prepping and coating the molding is a team effort. On any given day, you’ll find 7 to 10 Puget Sound Coatings team members working on various stages of the coating process as well as communicating and collaborating with the customer to meet priority and scheduling. The entire process, from initial arrival of the product to final shipment, takes one to three business days. However, we are in an ongoing production and completing pieces from start to finish daily. In addition to the quality of our work, the range of industries we work in and the variety of projects we take on truly sets us apart. This project is a good representation of our high-end finish work, which requires a different set of skills than the large industrial pieces we blast and coat for structural steel companies or the metallizing work we complete for the marine world. Working with such a diverse range of clients is one of the most rewarding aspects of our job. As one of Seattle’s longest standing surface preparation companies, you can count on our experience and expertise to get the job done. Find out more about our painting and coating services, and discover how we can support your business. 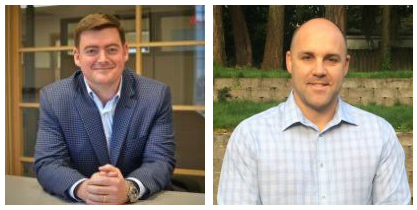 Brian and Eric bring with them a wealth of experience in painting, coating, surface prep, contracting, and manufacturing from both a local and national lens and are eager to apply their backgrounds to the future of PSC. The first order of business? A dedicated, focused effort to service and understand PSC customers, executing their business needs at a consistent, exceptional level. This means engaging customers in a multitude of ways including in-person visits, social media, and through an updated web presence. The new additions to the team are excited for the road ahead and proud to be a part of the history, and future of PSC. Expect to hear from Brian, Eric, or one of the other new members of PSC in the coming months as the company transitions into the next chapter ahead. Thank you for your continued business, here’s to an exciting and busy Fall!